At a recent lecture at the Magic Castle where Stan sold all of his books and tapes, by far the best seller was this ebook. Everyone reads their horoscope in the paper or on the net. 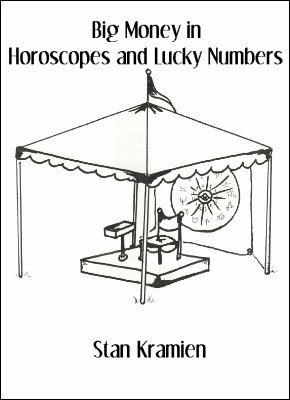 The interest in horoscopes, numerology and numbers has never been greater. In this ebook Stan tells you how to market this newfound skill the very first day you buy the ebook. Included are venues, the psych code and drawings of his fair booth set up. No other business in show biz offers so much return for so little investment. 1st edition 1987; 30 pages. This little book on pitching has been gold to many people, and still can be, for those who want to do the work. I have used Stan's ideas, and will continue to do so. For those who say it is "old-fashioned," I say, just try it at historical themed venues, and keep it light and breezy. It works. Everyone wants their horoscope on a warn summer day.